Warning: This is a VERY photo-heavy post. I couldn't bear to cut out more pictures because it was such a beautiful day. We are so happy for Will & Brittany! The Wedding took place at the Springville Museum of Art - it was so elegant. Oh, these flowers are just gorgeous! 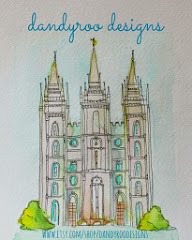 Janalynn is so talented! The back of Brittany's dress was stunning! The photo just doesn't do it justice. So beautiful. Elise was such a life-saver! I wouldn't have gotten half of these pictures were it not for her and Dan! Ruby is so happy she is clapping and sticking her tongue out. That means she's super happy. We all are! Tess made all these collages - so fun to look at all the pictures of Will & Brittany when they were dating! Because the reception was outside, it felt like such a beautiful garden party. It smelled like Disneyland with the popcorn machine going. It was so festive with the live jazz band! Just perfect. These menu boards were one of my contributions to the night - chalk is hard to write with but I'm so happy with the results! Oh they are both so cute. I just love a baby on her daddy's shoulders! The Touhy's kept Ruby entertained too! Whew! Did you make it through all the pictures? It was such a lovely night. I wish I'd gotten more pictures of me! I guess that's what happens when you're the one taking the pictures. We really are so happy for Will & Brittany. The wedding was so beautiful and we are so excited to see the beautiful life they have ahead of them unfold! 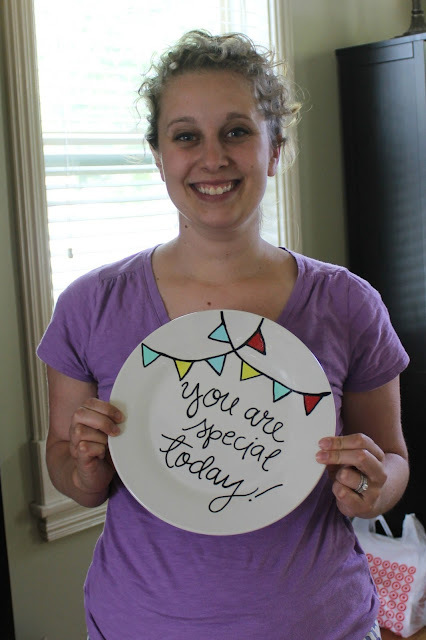 For Week 2 of the Jenny-Candace Craft Club, We made these cute plates and went to lunch at Noodles & Company. I'd seen this plate on Pinterest and thought it was so cute! 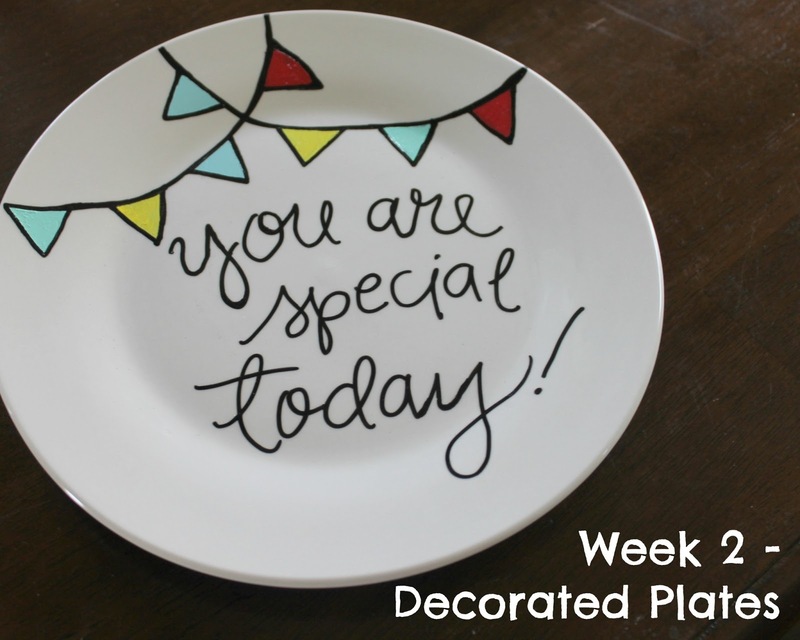 Decorating plates like this is really super simple. Your just decide your design and draw it on! Then you can bake it in the oven to make it dishwasher safe. We just got the plates at the dollar store and the paints from Michael's. I discovered that nail polish remover takes off any smudges or mistakes. Which was such a lifesaver - I make a lot of mistakes. These are such an easy and quick craft! This is all you need. Plus a plate to decorate, of course. Here's a tutorial for decorated plates if you want some guidance! since i'm not doing monthly updates anymore, i figured it would be fun to bring back occasional ruby tuesday updates. this girl does too many cute things that i don't want to forget about! yesterday ruby was blowing on her little bits of peanut butter sandwich. i guess she has seen me blow on her hot foods so much she thinks that's just what you're supposed to do before you stick something in your mouth! ruby is so darn friendly. if we're outside and someone walks by, she'll wave so intensely. the sad part is, the people usually don't see her waving till they've passed her. it's so cute though. ruby loves the trampoline at uncle von's house. like, so much. we colored for the first time this week and ruby may have inherited some talent! or she just is really good at hitting things and crayons just happen to make a mark when they are hit against something. i'm not sure sure if this is just an extension of the dog lover thing, but ruby has started lapping up bath water. she'll bend over till her face is practically in the water and then try to drink it up. it's funny but i don't like her trying to drink soapy bath water! ruby is so close to walking! her goal was to be able to walk by will & brittany's wedding (which is friday) but i don't think that's going to happen. ruby loves dolls. 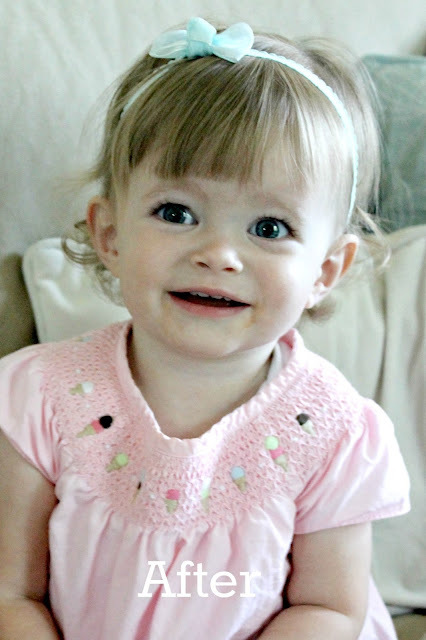 we went to the disney store and she saw one of those super cute animator's collection toddler princess dolls. her eyes lit up and she was pointing and saying "ba, ba, ba". she was really unhappy when we had to put the dolly back and go home! maybe for christmas, ruby girl! ruby cannot figure out sippy cups. i've tried a bunch of different kinds - even ones with a straw - and she just can't seem to get the hang of them. Ruby's hair was getting really long in front and she kept pulling out her hair clips so I really had no choice but to cut it. I was nervous about doing it myself, but I figured it was just hair and that it would grow back! Dan helped me hold her still and I trimmed her bangs as fast as I could. She was not very happy. In fact, she screamed pretty loud. But she looks awfully cute (and awfully grown up). My very best friend, Jenny, is a school teacher. Which means she has all of the summer to play with me! We have made a whole long list of things to do, crafts to make, places to go and food to eat this summer! 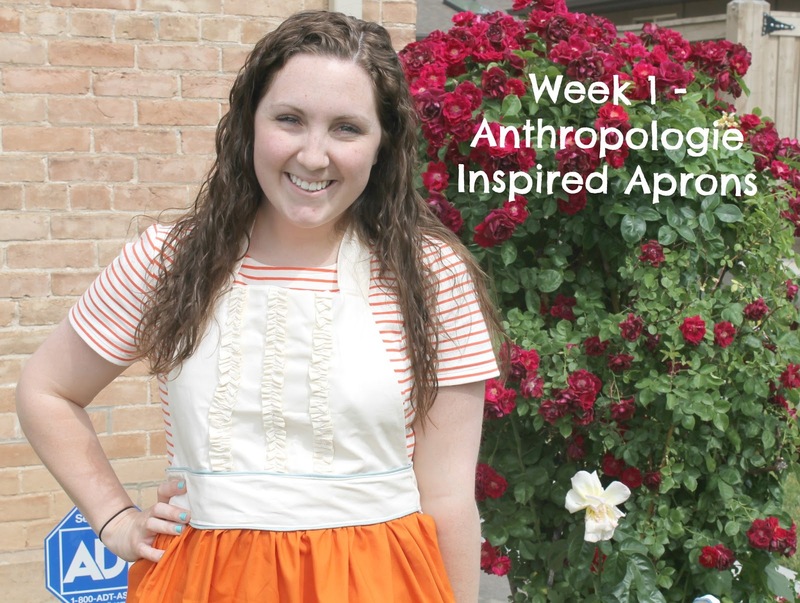 For our first hang out, we went to lunch at Kneaders and made this Anthropologie-inspired Apron together. It was so fun. And Ruby conveniently slept through most of our crafting time! If you're curious and want to try your hand at making one, we sort of followed this tutorial but I kind of free-styled it in the end. Stay tuned for next week's activity! I really really wanted to throw Ruby a First Birthday Party. But, we were out of town, and then we were home for a couple of days, and then we were out of town again. By this time, it was about 10 days after Ruby's birthday. Our window for a party was closing quickly! I literally planned the party on the drive back from Las Vegas (that was a Friday and the party was on Sunday evening). Not too shabby for a quickly thrown-together party! Happy Birthday Ruby Girl! Your party was really fun. We had an Ice Cream Social with all the treats and toppings. It's a really good thing that Dan's Aunt Susan has a party rental business or I really couldn't have pulled this off. Having chairs for people to sit in makes such a difference! We got Ruby a cupcake from The Sweet Tooth Fairy (Strawberry Shortcake with a Chocolate-Covered Strawberry on Top). I've gotta say, this girl isn't crazy about getting frosting and stuff all over her face. She was quite dainty with the cupcake - not the typical cake smash. 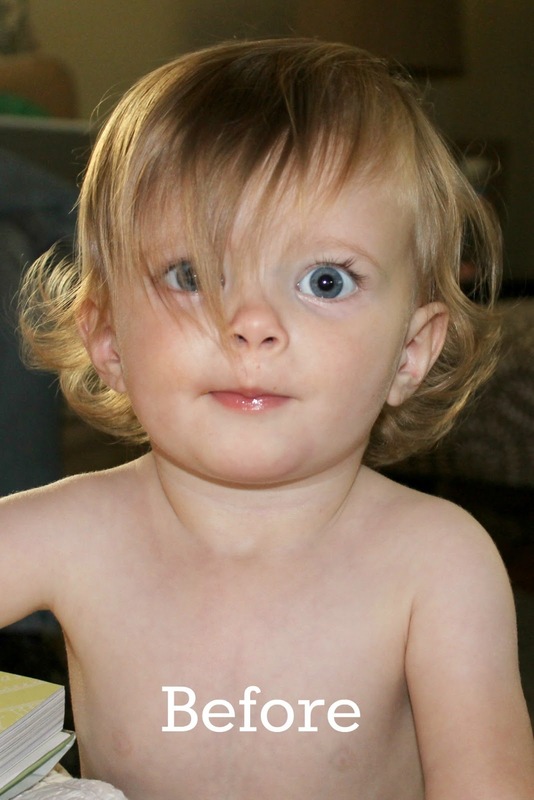 I think my brother, Ethan, ended up eating a lot of the cupcake because she didn't really care. I should have gotten her a Chocolate Cupcake. Thank you to everyone that came at such short notice! Ruby is so lucky to have such good friends and family. Happy Birthday Roo! christina, ruby, brad and great grandma and grandpa alleman - brad and christina gave roo a dump truck toy because she loves cars so much. it was really perfect. g&g alleman gave her a $10 bill! her first money ever. now she's got something in her piggy bank! our neighbors and friends from around the block. ruby and her major haul. this is my absolute favorite photo from the night.